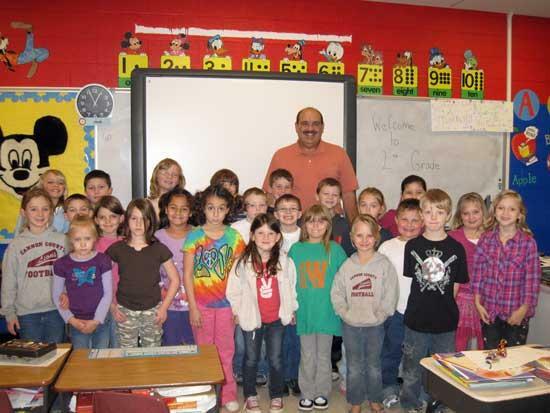 Mr. John Hembree visited Mrs. Kathy Mullins' and Mrs. Faye Naylor's 2nd grade classes. He spoke and gave a power point presentation over his recent trip to Guatemala. Front row: Kelsey Luna, Lilli Hardin, Patsy Gammon, Jenna McMackins, Alexis Freels, Gracie Roberts, Trey Duncan, Kaylee McNutt. Middle row: Lora Roberts, Elijah Underwood, Karlee Vassar, Sofia Gomar, Cody Warren, Cameron Decent, Grace Campbell, Brady Davenport, Maya Reed. Back row: Rachel Choate, Austin Mitchell, Lily Guenther, James Vassar, Riley Poteete, Gus Davenport, Karina Fann.